MIT researchers trained an artificial intelligence using Reddit and you won’t believe what happened next. Just kidding. Of course you will. The worst things happened. Norman, who naturally gets his name from the guest-murdering proprietor of the Bates Motel, is the “world’s first psychopath AI,” according to its creators at MIT. First, possibly, but certainly not the last. The creation is a kind of thought experiment designed to explore how the data we use to train machine learning algorithms ultimately influences its behavior. In this case, the deep, endless well of human misery that is the internet was used to teach poor psychotic Norman the ways of the world. 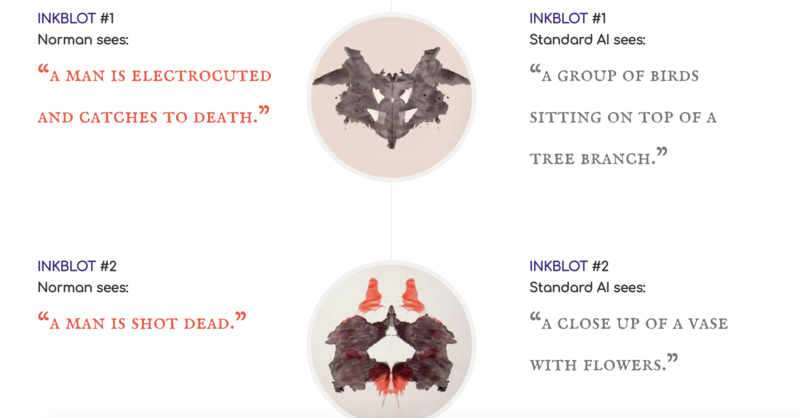 In particular, the team used “an infamous subreddit […]that is dedicated to documenting and observing the disturbing reality of death.” That information had a fairly profound impact on Norman’s gig captioning photos (inkblots, in this case), when compared to neural networks trained on more standard data. You get the gist, right? The rest can be found over here.